The title sentence sounds quite radical, but there is a truth behind these words. Usually, portfolios are composed by different kind of assets. Every analyst, every advisor always recommends a diversified portfolio with fixed income assets, stocks, commodities… But the question is: ok, everybody says that, but how much do I earn for the diversification. The answer is simple: T-Advisor has the tool for it. Do you remember an older post about value at risk (VaR)? This measure shows the probability that your portfolio loses a maximum percentage in a period (week, month or year). 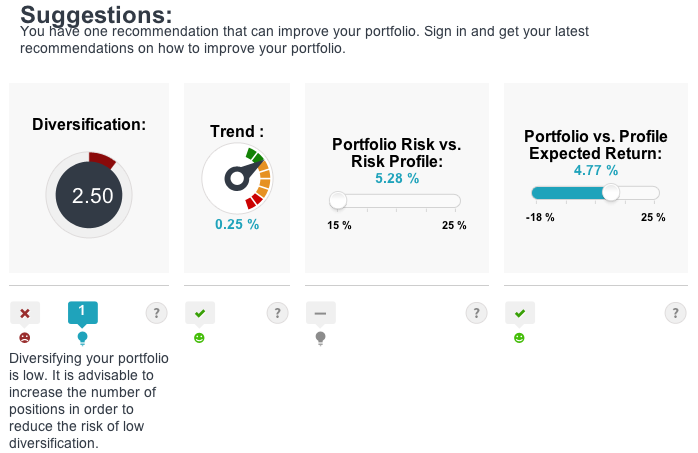 To complete this information, T-Advisor has available a tool called “diversification benefit”. Look at the picture above. The item compares the difference between the decision of diversifying or not the portfolio. Through complex statistical calculations, T-Advisor reports the investor about the money he or she could lose if his or her assets would be not diverse enough. 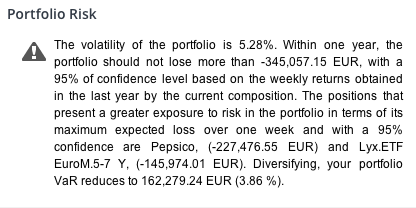 In this example, this portfolio has an 8.21% VaR 1 year. If this portfolio would not be diversified, he risk would increase till 12.07%. This investor could have 4 points more risk of losing money. This figure has to be linked with other T-Advisor tools and data. For instance, the picture before reports about the volatility and the effect of a diversified portfolio with that volatility. In this case, T-Advisor has a follow up analytics. This chart has a report about diversification. In this example, the tool says that the diversification is low. With this low diversification, VaR is high (8.21%), but it would be worse with any diversification. The difference between diversified and undiversified VaR would be surely higher, if this portfolio had more different assets. There are mantras amongst experts and advisors, such as “you have to diversify your portfolio”, but nobody measures with figures this advantage. T-Advisor does it and reports its users about it. Data and figures about our portfolio like this mean less chances of losing money. This entry was posted in Discover and tagged Benefit, Diversification, VaR on April 10, 2014 by Oscar Garcia.